WASHINGTON - Justin Trudeau will visit the North American capitals next week amid early signs of turbulence in continental trade negotiations that have stoked some concern from NAFTA supporters about the agreement's long-term prospects. The prime minister will meet U.S. President Donald Trump during a two-day visit to Washington, followed by a meeting with Mexican President Enrique Pena Nieto during a two-day visit to Mexico City. 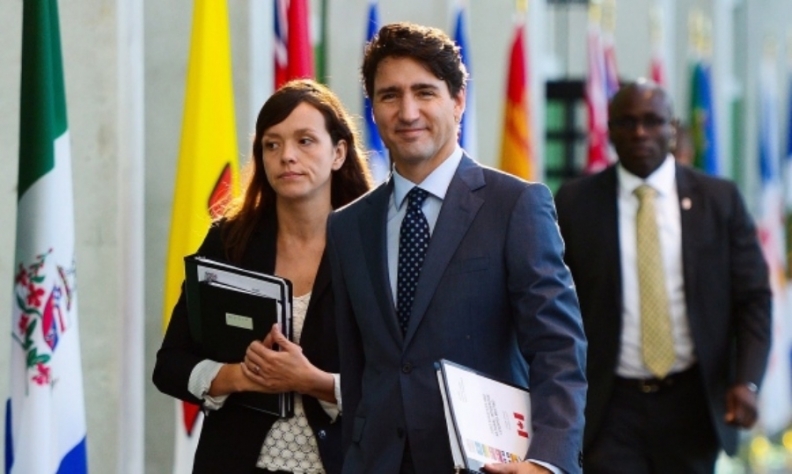 The trip was not specifically designed around NAFTA, say Canadian officials, noting that it was in the works for some time and began with an invitation to a women-in-business summit in Washington, coupled with Trudeau's long-standing plan to visit Mexico. But trade will come up, they said. Some officials have been unnerved by early sticking points that have emerged even before the negotiations touch the hardest issues: auto parts, dairy, the dispute-resolution system and the U.S. idea of forcing a mandatory review of NAFTA every five years. A rare major file that has already opened involves so-called Buy American rules. And America's neighbours were dismayed by the U.S. proposal during the last round in Ottawa: that access to U.S. public works be restricted to a one-for-one ratio — a dollar's worth of U.S. contracts for every dollar of contacts across the border. "Which is ridiculous," said an official in one of the other NAFTA countries. "Whether they're just driving a hard bargain [or serious about this idea, we] don't know." Canada's position is that it's unrealistic to expect perfect reciprocity given massive differences in market size. It has pushed back against some of the numbers cited by fans of Buy American rules, who argue the U.S. offers nearly 100 times more access to government procurement ($198 billion) than it gets from Canada ($2.25 billion at the federal level). The Canadian embassy recently sent Washington lawmakers a letter citing a counter-statistic: that just three per cent of U.S. federal contracts are won by foreign suppliers, while 11 per cent of Canadian federal contracts go to foreign firms. One Washington trade consultant says that's not the main sign of trouble. Eric Miller says what he finds worrying is that even on comparably simple issues like textiles and fruits and vegetables, the default U.S. position so far tends toward restrictions on trade. He said that's causing anxiety in boardrooms, given the Trump administration's stated intention: to get a new deal, or terminate NAFTA. He said he's aware of more than one Fortune 500 company that has briefed its board on the need to plan for the possibility of a world without NAFTA. "Things are going pretty badly," said Miller, head of the Rideau Potomac Strategy Group, which has advised different clients on trade issues, including Industry Canada. "There are a number of proposals which have been put on the table by the U.S. that are considered by many in the trade community to be radical — or certainly a radical reorientation based on both what's in the current agreement and what's become established practice on international trade." His advice to Trudeau next week: Learn Trump's intentions. "Look into the into the eyes of the president and figure out if the U.S. is serious about getting a renegotiated NAFTA," Miller said. "(Try) to understand to what extent these are hard and fast U.S. proposals, or are they posturing." It's also important to speak with Mexico, he said, about how to respond should Trump trigger the NAFTA pullout clause. Should that crisis scenario emerge, Canada and Mexico would have allies in Washington: scores of U.S. lawmakers are strenuously opposed to torpedoing the deal and could argue that the president lacks the constitutional authority to do it alone. Some NAFTA-supporting lawmakers spoke at Canada's Washington embassy on Tuesday, as it hosted a gathering of Latino legislators, some Democrat, some Republican and all expressing a desire for a quick and mutually beneficial deal. In their speeches, Marco Rubio, Mario Diaz-Balart, Henry Cuellar, and Will Hurd touted the benefits of trade not only on the economy, but on regional stability. Some voiced a sense of urgency in getting a deal before Mexico and the U.S. enter national elections next year. Cuellar, a Texas Democrat, said that if talks run into election season, some lawmakers will be afraid to vote on the deal. Hurd, a Texas Republican, laid out three guiding principles for NAFTA: "Do no harm. Make it better. Do it quickly"
Rubio expressed confidence it will get done. "I'm not worried," the senator told The Canadian Press. "It's difficult, it's hard, it's going to be hard because these are issues of great importance in all three countries. But I'm generally optimistic that not only will they make progress on it, but that it will be done expeditiously."